Hi everyone! Sue from zhush.com and The Zhush blog here today, happy to be participating in the LDV Favorite Rooms series. When Paloma first asked me, I initially thought "how am I ever going to be able to pick which room is my favorite?" I love to sleep, I love to eat and computer and TV time also rank pretty high with me. But, ultimately, I chose a room that we do absolutely none of those things in. After giving this some thought, I chose our living room. Some of you may have already seen this room, as it was featured in both Cottages and Gardens Magazine and HGTV Magazine, and these professional photos are from both those shoots. As you can see, the room is a large "L" shaped room, a result of our home renovation where we pushed out the size of our original living room and took over space from an old sun room. Once the actual build out was over, we were thrilled with the results, but I felt overwhelmed at the prospect of trying to decorate such a large and awkward space by myself. All the windows, weird interior doors and the actual shape of the room proved to be too much for me, and I set out to find a professional designer to help me out. I knew from the get-go that Lauren Muse of Muse Interiors was the right fit! We had a great rapport and quickly started sharing design ideas and inspiration via emails. Lauren introduced to me to Domino magazine and I immediately subscribed. It was during our inspiration quests that I first discovered design blogs. Once Domino folded, I found myself going online more and more for ideas (like the end tables in this room). And, then, shortly after, I decided to start my own blog. Lauren knew how to anchor the room properly with a really great looking rug. 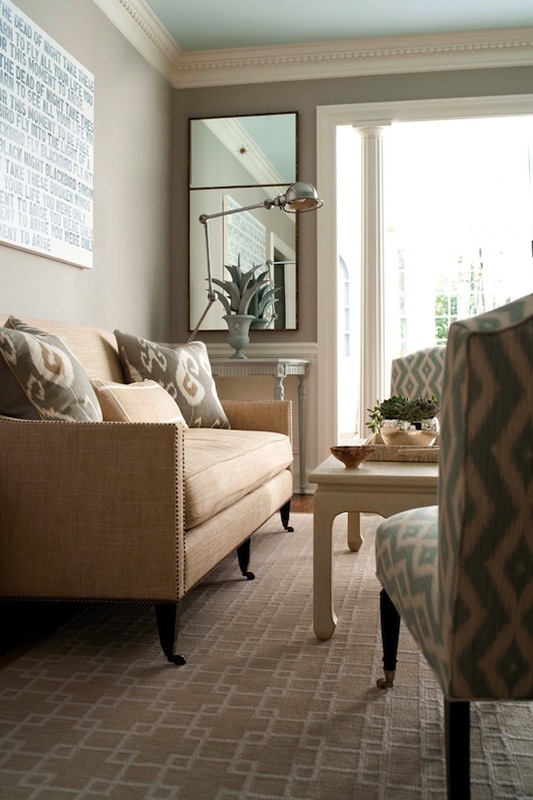 She then created two separate seating areas, which really makes this large room feel cozy and intimate. Once all the furniture and window treatments were in place, I handled the accessories and artwork on my own. Hence, my love of zhushing! Through blogging, I discovered two of the artists whose work are now in this room (Matthew Heller and Amanda Talley). I really love how this room came out. With it's "pops of purple" and zhush.com accents throughout, it's completely a reflection of my taste and also connected to the story of my blog and my shop as well. Finally, here's a true life, un-styled shot of what the room looks like today. Thanks Paloma, it was fun for me to re-visit the beginning of my online journey and look back at this room as the "start of it all." This has always been one of my very favorite rooms...warm, inviting comfortable and yet classy, artful, contemporary. The silver balloon dog is perfect for the space-exellent touch of sophisticated-whimsey! Beautiful living room. It is so fresh, up to date and modern. A great space for entertaining. LOVING all the neutrals in that living room!!! love the use of the chaise to break up the 2 seating areas. her livingroom is huge...love how she styled it! It's a wonder why magazine stylists would change anything in your beautiful living room. Having seen it in person, we know you have amazing taste, Sue! She has an incredible eye for color. Amazing!! Where can you get the silver balloon dog? I absolutely LOVE it!!!!!! !